Peter Nadin, Tomato II, 2012, Lycopersicon esculentum, pigment, handmade bamboo, cattail paper, 64 x 40". This exhibition of thirteen paintings and a short film is upstate New York artist Peter Nadin’s first solo exhibition since his 2011 showing at Gavin Brown, which marked the artist’s return to the New York art world after nearly a decade of abstention. Nadin spent the interim years as a farmer in New York’s Catskill mountains, raising livestock and crops, and producing paintings and sculptures as a part of that milieu. As Nadin intones in Taxonomy Transplanted (all works 2012), a 16-mm film made in collaboration with designer Aimée Toledano, “If you want to sell the pork, you have to name the pig.” The film is a meditation on epistemologies of agricultural production. Over images of a forest landscape, Nadin pronounces the names of trees due to be processed in a lumber mill. The film, the exhibition’s title work, articulates agriculture’s taxonomical processes as a means of consumption, and intimates the constituent and chimerical self-knowledge of its products. Phrases from the film reappear in the paintings on display, botanical combines on paper that the artist has aggregated from bamboo and cattails pressed in pond water. These works include plant matter that is half-embedded in the flecked, pulpy sheets, overlaid with words sketched in pigment on their surfaces. 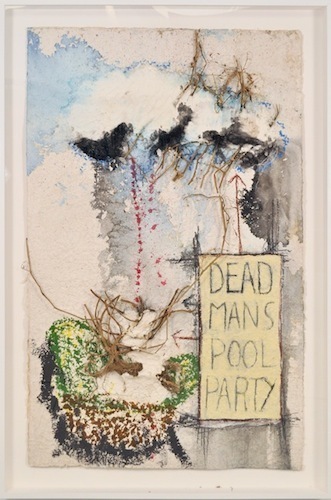 The phrase DEAD MAN’S POOL PARTY frames pieces of vine in Tomato II; EFG sits above a set of branches in Ash; LINE LINE LINE lays above dried stocks in Wheat II. Organic detritus collects at the bottom of Nadin’s shadow box frames, which suggest the encyclopedic display of a naturalist’s collection. The checklist gives scientific names for the plants set in each painting––Fraxinus in Ash, Carduus in Thistle, Aloysia triphylla in Lemon Verbena I. But Nadin’s taxonomical wordplay is softened by the simple earnestness with which he presents the body of work as a whole. This ethos is on display at the gallery’s entrance, where various edible products of Old Field Farm, where these works were made, are for sale.